July 2010 | MMA Fighting Events Videos Techniques UFC Fight Picks and News. Last night, July 30th, Spar Star Promotions held a C.A.M.O sanctioned MMA event, “Mayhem”, in El Monte and welcomed Chingasos MMA to check out the action. As we entered the venue, we were surprised as at how well the event was organized. There was food, drink and seating for spectators that was well planned. Starting off the MMA action was Sacha Feinnan from PKG and Michael Pollinger in a 145 lb match up. These two fighters traded chingasos and takedowns for three grueling rounds. Sacha's striking seemed a little more accurate and the judges scored the fight his way. The next two MMA warriors that stepped into the cage were Cole Riley from O.C. Boxing Fitness and Jacob Rockymore from Legends MMA. Jacob quickly locked in a body lock and worked to get the fight to the ground. He finished the takedown, took top position and was able to pass Cole's defense. Cole managed a reversal, but unfortunately for him, Jacob reversed right back into good side control position and locked in an arm triangle that finished the fight in the first round. Up next were Darence Atkins from Impact Fitness and Bill Burley from Unbreakable. This one was mostly all Darence and his athletic slams. Bill went for a kneebar that came really close to ending the fight, but Darence was just too strong and escaped. The fight went all three rounds, and the judges gave Darence the win. Fight four featured Damon Lymon from Gracie Barra and Randy Romero from Team Destiny. Randy overwhelmed Damon with an onslaught of chingasos and secured a takedown. Damon did a good job defending with a solid half guard and made it through the round. Unfortunately for Damon, Randy opened up round two with a storm of chingasos that put Damon on his back where Randy was able to finish off the fight with a vicious ground and pound. James Acosta from PKG and Keith Carson from Riverside Sports Academy faced off in the fifth fight. This fight went back and forth featuring some tough clinch action and chingaso trading. It was a tough fight to score, but Keith pulled out a split decision. The sixth fight, Craig Dunlop versus Gerardo Flores, get my vote for fight of the night. In the first round, Craig landed a chingaso that John Wayne would have been proud of. It caught Gerardo on the nose, and it looked to be broken as blood began to spill in the cage. Gerardo did not panic and actually answered with a solid double leg takedown. Craig secured what looked to be a fight-ending guillotine but Gerardo was able to fight out of it, bloody nose and all. Craig went for a triangle but Gerardo was able to escape. The fight would continue into the second round where Gerardo was able to ignore the bloody nose, outwrestle Craig, get into a solid ground and pound position, and finish the fight. Edward Chavez from Sub Factory and Richard Placencia from Team Destiny stepped into the cage for the seventh fight of the night. This fight quickly ended up on the ground where Edward established mount. Richard made a mistake while attempting to escape and Edward capitalized, taking an arm bar and finishing the fight. The eighth fight featured Donovan Carboney from Galvan Combat Systems and Chris DeRoma. Donovan seemed to have a big crowd backing him, and used the energy to get the fight to the ground early. He was able to finish the fight there with a solid ground and pound attack. The last two fights, Jeremy Gendreau vs Ronald Henderson and Anthony Olivas vs Eugene Marenya were cancelled due to a disturbance in the crowd that necessitated pepper spray to be used. Because of the pepper spray, the building had to be evacuated. Even so, it was a great night of fights, and I look forward to another MMA event/production from Spar Star Promotions. The next C.A.M.O sanctioned event in the Los Angeles area will be Proving Grounds 3 at the Fight Academy in Pasadena. When someone first starts training in MMA, BJJ, or submission grappling, you learn the basics first, but what everyone wants to do, is learn the exotic, entertaining, and or flashy submissions. As you progress through your training, you realize that those exotic, entertaining, and or flashy submissions aren't that easy, or even practical to pull off in competition. For that matter, they're not even easy to pull off in practice/sparring. So when one of those submissions, such as the flying arm bar gets pulled off, it's as exiting to watch as a successful trick play in football. The surprise and it's low percentage success rate give it the "wow" factor that fans in any sport can appreciate. Check out the fight video of Carlos Valerie and Daisuke Nakamura going at it at the M-1 challenge. Not too many chingasos needed in this fight. Here's a nice instructional video on how to do the flying arm bar by Submissions 101. Give it a try! Here's a nice intructional video by Submissions 101 on how to do the flying arm bar. A couple of days ago I was at a grappling training session when Dave, a training partner and I were watching a grappling match go on in front of us on the mat. Paul was on the mat with another of our training partners and off his back transitioned from a triangle attempt into an omoplata attempt. He didn't finish the omoplata, but was able to use it to gain top position. At that point, Dave mentioned that he had never seen an omoplata in a "practical situation" I'm not exactly sure what he meant by "practical situation" but I'm assuming he meant in a real MMA match or submission grappling tournament. Anyway, long story short, It sent me on a quest to find the omoplata used to finish a fight in MMA. After some time searching, I finally found an awesome fight in Strikeforce last November where the omoplata was used to finish the fight. This is the type of fight that can turn a casual watcher of MMA into a true fan of the sport. Check out the fight video of Shane Del Rosario vs Brandon Cash. A few minutes into the fight, the announcer in as state of awe, announces, "This is nothing short of a mugging!" It was raining chingasos for Shane Del Rosario, and then....... check out the video! If you're new to MMA or just want to brush up on your BJJ/submission grappling, check out this video of UFC fighter and current welter weight champion George St. Pierre showing the omoplata. Savant Young and The Fight Academy MMA gym in Pasadena have been at the forefront of bringing sanctioned MMA fights to the area. Proving Grounds 1&2 where a big success, and now, to celebrate the Fight Academy's one year anniversary, Fight Academy will treat MMA fans to more MMA action with Proving Grounds 3. Proving Grounds 3 is set for Saturday, August 14th. The fights are not completely set, so if you're a fighter and want to showcase your skills and talent, contact Savant Young on Facebook or call him directly at 213-718-3886. Both the previous Proving Grounds events where sold out so make sure to secure your ticket A.S.A.P so you wont miss your opportunity to catch some live MMA action. Just to get you warmed up and pumped for the chingasos that will go down at Proving Grounds 3, check out one of the fights Chingasos MMA caught on video at Proving Grounds 2. 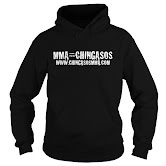 Here at Chingasos MMA we are fans of MMA and want to promote the sport of MMA, as well as fighters, coaches, schools, training camps and anyone else involved with, promoting, highlighting and showcasing the sport. With that being said, knockouts are part of the sport and this video is one of the best put together videos I've seen that showcases and highlights the MMA knockout. As an MMA website/blog, I feel we owe it to the person that put their hard work into creating this video by exposing it to those fans that might not have seen it. If you like it, be sure to pass it along. By the way, it was made by youtube user Caposa5 and it's titled MMA-The Knockouts of 2009-Vol.1. Which knockout in the video is your favorite? Here’s the line-up UFC 116 tonight. All fighters made weight, and they are all ready to throw chingasos.